I met Vishal Gondal (of Indiagames) yesterday at Proto conference, and he mentioned about his post on Nasscom blog, where he ripped apart Indian IT services companies for their ignorance towards social Media – and few who have joined it, only for the sake of it. Amongst other things, his post pointed out how the senior executives of the companies are still using old paper based communication amongst themselves, while they build state-of-the-art communication channels for their clients. Vishal also points out how Infosys Blogs and are just a PR stunt, and TCS is using twitter for giving Investor call details… And on linkedin, even though Indians are in maximum numbers, none of Indian companies post any jobs / announcements there – where as companies like Google, Microsoft & Cisco have them in large numbers. The post evoked some interesting comments, most of them which are probably coming from people working in these large Software companies. Well, looks like you need to do your homework on social media in B2B. Don’t know who gave you the authority to comment in a forum as prestigious as this. Infosys blogs: replies on blog posts a measure of their effectiveness? Wake up, hero. The Infosys team measures their effectiveness in obviously different ways. If five of the comments are from their target audience, who cares about the rest? And heard about SEO? TCS on Twitter: If you don’t want the info, don’t follow. The live tweet of the press conference has its faithfuls. That matters. Not what your “opinion” is. Who calls you (except yourself) an expert anyway? TCS on Facebook: I hope you got the last post was a week ago. Facebook wasn’t invented last century too. And TCS is neither Barack Obama, nor Coca Cola. So – traditional measures don’t matter. Well – you did get your objective right. Who would notice you if you didn’t mention Infy or TCS? I am completely in agreement with what Vishal mentioned in his blog post, incidentally, I was sharing the same opinion with founder of a large software company (I met him at the proto conference yesterday as well) for whom I have worked for close to 7 years. Question to Readers? 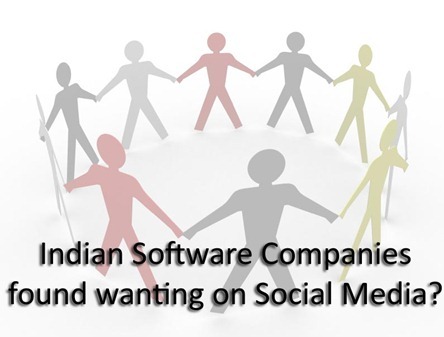 Don’t you think that Indian software companies are really found wanting when it comes to their presence in social media? The Best Money Managers show which country they will invest in ! Social Media when used effectively is undoubtedly a boon but there are FATAL RISKS attached to it. Like for example: Any Screw ups on the part of the IT Giants will spread like wild fire on Social Media. Moreover, the investors and employees might turn against and spread negative word of mouth when not delivered their interests. The B2B format of IT Giants is not very apt for Social Media promotion or business development or for that matter Internal or External Communication. This industry feeds on US and UK clients and the use of Social Media for Communication or Brand Building can turn out to be fatal for the Organization. Already the Scrip Performance of IT cos is highly volatile and reliance on Social Media will add fuel to fire. In a way, I approve the IT companies NO SHOW on Social Media…!!! Completely, agree, I remember in Cognizant there was a drive abt 2 years back to encourage people to blog. I am not sure how successful it was but overall, there is a big opportunity for these companies to exploit the power of social media. May be we need to convince them. The comments above are really offensive, I wont take the same path, but let me say this unequivocally, truth is all around us, only blinds, schemers and liars don’t see it. Choose your category! I am also agree with Vishal. Due to introvert behavior of our IT companies they are only loved by there customer. Hope to see some change.